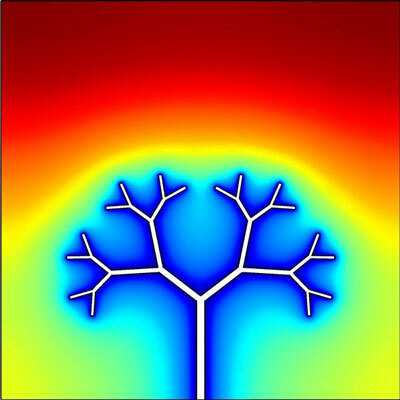 (Nanowerk News) Materials melt faster when the lines of heat spread through the cold material like the branches of a tree -- and the melting rate can be steadily increased by allowing the tree architecture to freely evolve over time, researchers have discovered. The finding could help improve phase change energy storage systems, which store heat by melting materials like wax or salt, and could play an important role in ensuring a smooth flow of energy from renewable sources like the wind and sun. The researchers report the results in the Journal of Applied Physics, from AIP Publishing ("Morphing tree structures for latent thermal energy storage"). In the following two decades, Bejan and his colleagues have shown how the evolution of various natural and man-made designs, from snowflakes to airplanes, is explained by the Constructal Law. In the new paper Bejan, along with fellow researchers from Duke University and the Université de Toulouse in France, have applied the law to increase the performance of the technology of phase change energy storage.